This adorable toddler princess just turned one year old. During this milestone session in New Milford, CT, her parents and grandparents asked me to capture her personality. She was a very shy little child but after some time she was able to trust me enough to follow my simple, gentle instructions. Her mom was standing right next to me and when we asked her to come, she just started running. I shot this photo with a lens that allowed me to blur the background enough to eliminate all distractions. My personal style in children's portraiture is to draw the viewer's attention to the child and eliminate all distractions from the background. 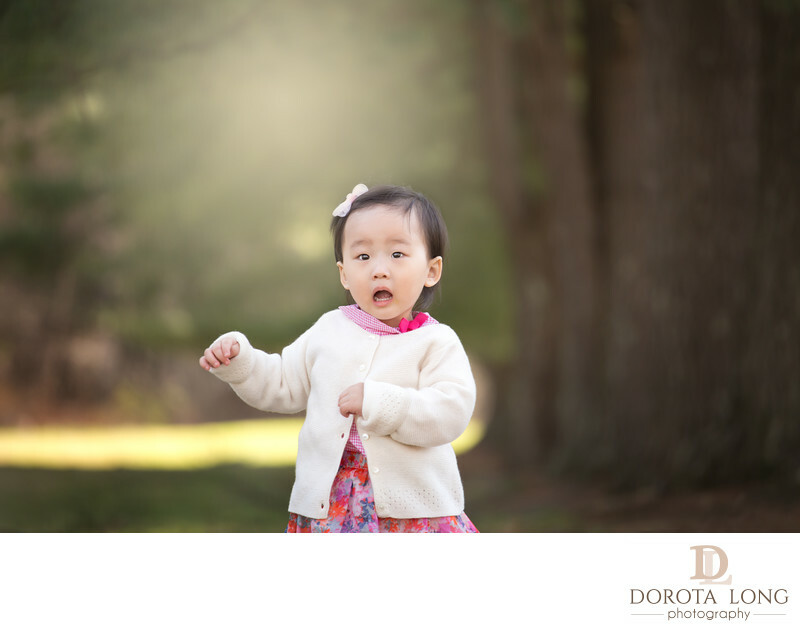 I love this little one's outfit, for her outdoor children portraits, her mom dressed her in a nice spring dress and a white sweater. I really liked it especially that this outdoor children session took place in the area of New Milford where there were many dark trees around which made the little girl really stand out. She kept running around during the session and I was simply following her and taken candid shots like this one. I find that with kids this age, the best way it is to photograph them the way the really are, no need for posing. Candid children portraits in this fine art style of photographing them is my favorite part of my job.